I saw a nice card somewhere that used the idea of having a tag sing open to reveal your sentiment and personal message. For the life of me I cannot locate the blog I saw it on! But the image stuck with me and I had to try one out for myself. I remember the sample card had a layer made with the Tulip Embossing Folder, so I knew I had to make my tag to fit inside that shape. I made my tulip layer out of Soft Suede, and then thought it would look good with a Basic Black cardstock frame. The tag itself is hand cut from Ivory cardstock and the sentiment was stamped in Bermuda Bay ink, then embossed with clear embossing powder. I then embossed lines around the tag with my Scoring Tool. I made the rolled roses from Strawberry Slush, and Bermuda Bay cardstock. I punched some flowers from Crisp Cantalope cardstock and turned them into faux suede layers to sit the rolled roses on. Their centres are the new Candy Dots in Soft Subtle colours. Their leaves are the bird wings from the Bird Punch and I punched them out of Pistachio Pudding cardstock. I finished off by tying the tag closed with some retired Baja Breeze seam binding. This was a fun card to make! I think the ladies at my Craft Class today thought so too. I sure hope they did.We had a discussion about the delicious names for the new In Colors from Stampin' Up! and decided we felt as though we were assembling a fruit salad or desert pudding instead of paper crafting today. Lol! PS: You can purchase all but the retired Stampin' Up! items used on this project from my store at SusanSalutations anytime, 24/7. Hi Vicki. 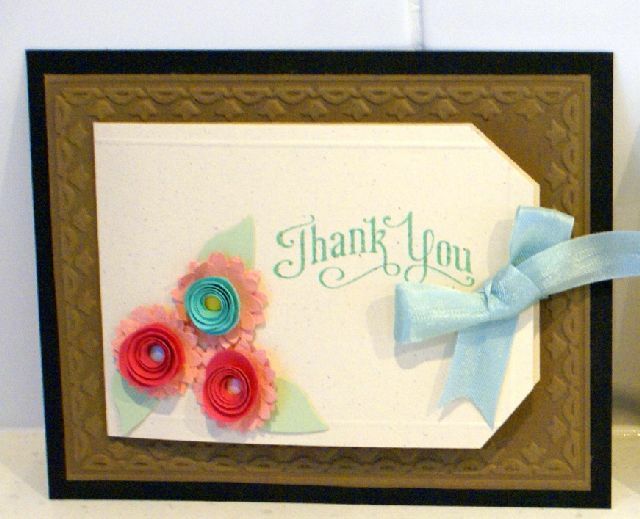 Thank you for your lovely comment :) Yes, the only opening bit on the card is the tag itself. The rolled roses are kind of therapeutic to do. Lol! Thanks again for stopping by! The New Seasonal Catalogue is Here! A Lovely Stampin' Up! Promotion!